$2 Million for Schools to be Raised with "One Tie Fits All"
Owosso, MI, February 05, 2018 --(PR.com)-- $2 Million for Schools with "One Tie Fits All"
What started in Hollywood is now spreading across the country, as a movement entitled "One Tie Fits All" introduces a new way to fundraise with simplicity and style (and no cost whatsoever). Raising funds and awareness one tie at a time, If The Tie Fits® is a fundraising platform that provides a national stage for causes to raise needed awareness and for organizations to raise necessary funds. With their national headquarters in Owosso, MI, Jack and Allié McGuire, founders and owners of If The Tie Fits, first came up with the concept of selling ties to provide support while working with the Hollywood Film Festival at Paramount Studios. Amidst the glitz and glamour of a red carpet event, the idea of a "Gold Tie Event" to raise awareness for social impact filmmaking with a unifying symbol (not a ribbon of support but a tie of support instead) was born. This idea quickly evolved to include multiple shades of ties supporting a variety of causes. And because tying a tie can be a bit difficult, a unique zipper tie with no special knowledge of knots required was adopted. And like the ribbon, this tie is made for men, women and children alike to wear. With a product (a collection of ties to support causes) and a platform (a website built to conduct and facilitate fundraisers on a national scale), If The Tie Fits is launching its first One Tie Fits All Campaign entitled "Save Music & The Arts: One Tie At A Time." This fundraising program will be offered to both public and private high schools and middle schools across the country. Because If The Tie Fits proudly gives back just as much as it gets, with the anticipated 3,000 schools participating in the inaugural year of the program, just over $2 million will be raised and provided to schools for their programs in music and the arts. And that’s just in a single year for a single cause for If The Tie Fits. With 10 more worthy causes already in campaign production, from Breast Cancer Research to Veteran Support, this is just the beginning for a brand that is built to serve any and all who want to raise funds for their organization while raising awareness for a worthy cause. For details on conducting a fundraising campaign in your school or organization visit www.onetiefitsall.com. Wear a tie just be'cause'. 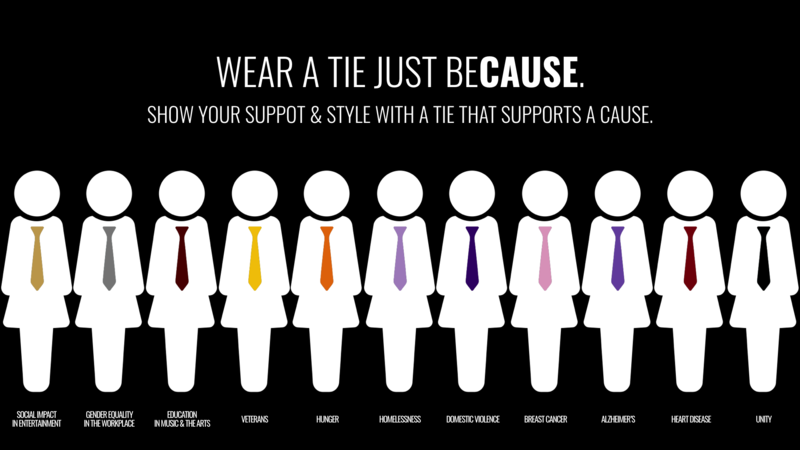 Show your support and style with a tie for a cause.